Perth, Western Australia, April 1, 2019 – Barrett Communications has been awarded a contract to supply the US funded Counter Narcotics Global Threats program for a republic in Central Asia. Please fill in the form below to download your free white paper on Barrett 4075 High power 1 kW HF Transmitter. Access to the Barrett guest code for a reduced admin fee on registration. Barrett have been given an exclusive offer, by Clarion Events (the DSEI event organiser) that we can share with you. This offer can be used when registering to attend and will provide you with free registration until 30th June 2017 and a reduced admission fee on your registration fee after that date. Please note that although the Guest Code allows applicants a reduced administration fee, all applicants are still required to go through the Clarion Events (DSEI event organiser) standard verification and payment process. To receive the Barrett guest code for DSEI, please complete the form below and the Barrett guest code and the Clarion Events link to register will be emailed to you. Request a meeting at Eurosatory with a member of the Barrett Team. We look forward to welcoming you to our stand in Hall 5A – B322. Please complete the registration form below and we will contact you to arrange a suitable time to meet. Request a demonstration of HF, VHF and interoperability solutions. 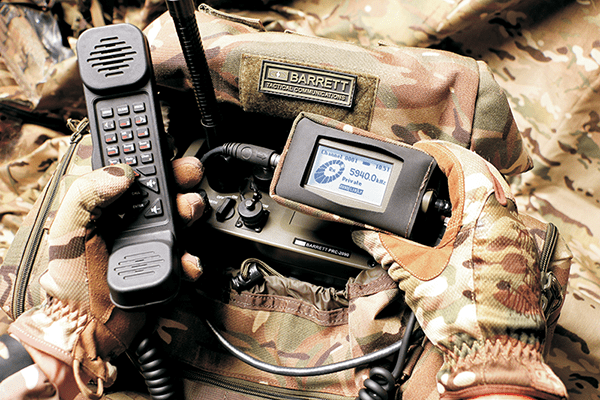 Please register your interest to attend a field demonstration of Barrett’s tactical HF, VHF and interoperability solutions. This form is only to register your interest and we will contact you via email to arrange a suitable time to discuss your demonstration requirements further. Please fill in the form below to download your free white paper on Barrett First Link RFDS. Please fill in the form below to download your free white paper on HF and VHF Rapid Field Deployment Systems. Please fill in the form below to download your free white paper on Barrett 4050 HF SDR.